Posted on Fri, Mar 30, 2012 : 5:56 a.m.
Plans calling for a pedestrian bridge along the Border To Border Trail that would run underneath the Michigan Avenue bridge from Riverside Park to Water Street have been rejected by two state agencies due to safety concerns. Instead, officials are considering having the trail cross Michigan Avenue just south of downtown Ypsilanti. The City of Ypsilanti was awarded a $300,000 grant from the Michigan Department of Natural Resources Trust Fund and the Washtenaw County Parks and Recreation Commission offered $275,000 in matching funds to pay for the nearly $600,000 bridge. Officials previously hoped to run a pedestrian bridge underneath the Michigan Avenue bridge from Riverside Park to the Water Street property. Distribution of the grant money was delayed to all DNR trust fund projects by the state's legislative process and the city has yet to receive it. But that gives city and Parks and Recreation Commission officials time to develop new plans. They are now considering building the pedestrian bridge across the Huron River just north of Michigan Avenue. It would lead from the west bank in Riverside Park to the east bank near the Fischer Honda dealership. The Border to Border Trail would then continue across Michigan Avenue just east of downtown Ypsilanti and onto the Water Street property. The Parks and Recreation Commission is proposing building a new recreation center to serve eastern Washtenaw County on the south side of Michigan Avenue along the Huron River. Officials are now hoping the bridge will cross the Huron River further north of Michigan Avenue. Linking Frog Island Park, Riverside Park, Water Street and Water Works Park is a high priority in the Ypsilanti Parks and Recreation Commission's master plan process. The trail would then continue southward into Ypsilanti Township, but it must cross the Huron River at some point if it is to be continuous. Michigan Department of Transportation and Michigan Department of Natural Resources officials are concerned over scouring of the Michigan Avenue bridge's supports. City Planner Teresa Gillotti said the MDOT report stated that a pedestrian bridge could impede water flow when water levels are high. The bridge is old, and state officials want to avoid any extra pressure or wear on the supports. The crossing could include a pedestrian refuge island or HAWK lighting, which is a high-intensity crosswalk signal. Overhead yellow lights flash at all times and pedestrians can press a button that will turn the light turn red to stop traffic. In response to a question about the safety of a heavily utilized crosswalk in the middle of a busy avenue near downtown Ypsilanti, Gillotti said that is the plan is being reviewed by MDOT officials who are the experts in make such determinations. “We’re going to work with (MDOT) to see if it’s appropriate to put a crosswalk mid-block,” she said. Council Member Pete Murdock asked Gillotti during a discussion on the issue at council’s March 20 meeting about placing the pedestrian bridge further upstream in Riverside Park. The trail would then run east to River Street. Gillotti said that is a possibility, and the Border To Border Trail would run down River Street to the Water Street property. But that location presents challenges with placing an ADA-compliant ramp leading from the river to River Street. There is no timeline in place for starting construction. 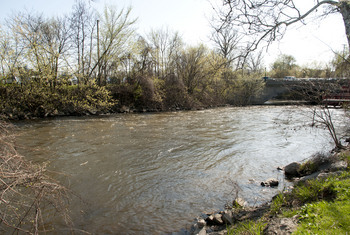 Fri, Mar 30, 2012 : 3:54 p.m.
For under $1000 a Huron River crossing could be two zip-lines with return ropes. This option is clean, green, unobtrusive, and very attractive to typical Border to Border Trail users. Sat, Mar 31, 2012 : 1:53 a.m.
Nobody with a bike will ever use zip lines. Fri, Mar 30, 2012 : 1:41 p.m. There are nine traffic lights on Michigan Avenue in about a mile, from Ecorse to Ballard. If you drive at the speed limit, you are guaranteed to stop at at least seven of them. I'm sure that has something to do with people driving above the speed limit, racing to beat as many lights as they can. If another stop is added at random times when people are trying to cross, it's only a matter of time until somebody doesn't stop and hits a pedestrian. Is there any reason why the lights can't be synchronized better? Fri, Mar 30, 2012 : 1:31 p.m. There are two crossings by Michigan Ave and I 275. These bike paths parallel I 275. They do stop at each lite and this way one can cross safely across. The first is at Haggerty and the other at Ford. I like this idea. The bike path starts on Morton Taylor near Sheldon. Great idea and can't wait to try it. If I can convince my bike of this idea. Fri, Mar 30, 2012 : 12:54 p.m. I enjoy biking around Ypsilanti, and I was enthusiastic about having a crossing under the Michigan Ave. bridge, but I don't think a street level crossing in the middle of the block is a good idea. The heavy traffic in that section of Michigan Ave. usually runs a good 5 mph over the 30 mph speed limit. That would make it very unsafe to install a HAWK crossing light. Fri, Mar 30, 2012 : 12:48 p.m.
@ Pete Murdock: I agree. &quot;Pedestrian Bridge Under Michigan Ave Rejected As Too Dangerous,&quot; for instance, would have made it much clearer. Fri, Mar 30, 2012 : 11:59 a.m.
@Davidian That's the point. The original proposal was to cross the Huron River by going under Michigan Avenue. MDOT rejected the idea of going under the bridge. Now we are looking at other locations to cross the River using the grant dollars. The headline makes it sound like the project is dead. Fri, Mar 30, 2012 : 11:36 a.m. Headline is terribly misleading. MDOT rejected the Border to Bprder Trail Bridge UNDER Michigan Ave. As the article rightly states, there are two other river crossing alternatives being discussed - one a little further upstream and the other at North Street by the Lutheran Church on River Street. Fri, Mar 30, 2012 : 11:49 a.m.
How is the headline misleading? The bridge has to go over the river...not under it. It doesn't say anything about where the rejected bridge was to be located. 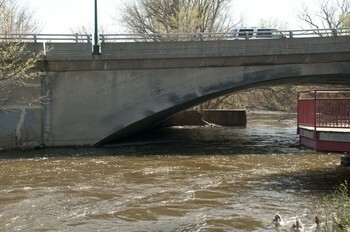 Fri, Mar 30, 2012 : 10:56 a.m.
Good call, that bridge is buried during high water as it is, it's a serious pinch point. I think it's clear that putting another bridge upstream would cause serious erosion to the bridge and the banks. Makes sense. Fri, Mar 30, 2012 : 10:38 a.m.
Fri, Mar 30, 2012 : 10:59 a.m.
Michigan Ave bisects downtown, at least most people look at it that way I think. Abes's would be on the north side of the street and the police station on the south.